Fighting has devastated their residential street, shattering the glass windows of its houses and blowing a gaping crater into the middle of the road. MOSUL: For two weeks, Yunis Mohammed and 17 relatives huddled terrified in the cellar of his west Mosul home as the Islamic State group fighters fought off advancing Iraqi forces outside. "The jihadists would knock on the door but we wouldn't open," the 39-year-old mechanic says, finally sitting under a tree in the sunlight after Iraqi forces recaptured his neighbourhood this week. Mohammed's family, including eight children, hid in the basement petrified that, if they made any noise, IS jihadists would storm in, he recounts. "We'd give the children a sleeping potion to stop them from talking. If they had heard us, the jihadists would have abducted us to protect themselves," he says. IS fighters have used civilians as human shields to defend themselves from approaching Iraqi forces, who on February 19 launched a push to retake west Mosul. When the jihadists were near, "we could hear their voices and we could hear them talking on their walkie-talkies," he says, adding some IS fighters "didn't even speak Arabic". 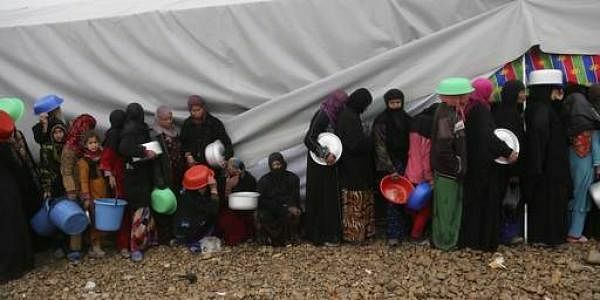 Other residents in the same district of Al-Danadan, which is now under Iraqi control, say they hid at home during the fighting, surviving off their food reserves. "We couldn't go outside because of the IS fighters," Manhal, 28, tells AFP, without giving his second name. "Those who went out were taken hostage. The fighting was very violent. Mortar rounds fell on our roof and inside our yard," he says. His neighbour Mohammed describes being caught between the warring sides. "We were stuck in the middle. Open this window, and there's the army. Open the other, and there's IS," he says. Three entirely charred cars sit piled on top of each other, propelled there by a powerful blast. "It was like an earthquake," says Ahmed, who was holed up inside his home with his wife, two children and his 71-year-old father. His garden wall lies in pieces, and segments of the tarmacked main street lie strewn all over his lawn, under a clothes line back in use. The 35-year-old teacher points to a rectangular-shaped hole in a wall on his garden's edge. IS fighters "made openings between the houses" to slip from one to the next without being seen, he says. His aged father approaches with slow steps, dressed in a traditional long grey robe. "It was dramatic. We were paralysed by fear, especially the women. Our car burned," he says, his voice breaking. A neighbour emerges in a doorway, dressed in a thick black coat despite the spring heat. "They took Karam and his family," he says gravely, running prayer beads through his fingers. "We were surrounded by monsters." He and his neighbours are breathing a little easier after the years living under IS rule. But a few streets down in the same neighbourhood, IS snipers lie in wait on rooftops near the archeological museum retaken by government forces. From time to time, the crackling of gunfire can be heard as a soldier darts across the road to tease the jihadists.